Where is it ? 85 Kilometres west of Faro Airport. About one hours transit time by car. How Big is it ? The Town of Lagos is a major tourist centre and the home to over twenty thousand permanent residents. From may to september migrant workers flock in from overseas and the rest of Portugal. Who goes Theres ? Like the rest of the Algarve, Lagos is a popular resort with families all year round. Visitor numbers hit a quarter of a million at peak times in July and August. What about Food and accommodation ? Lagos has numerous excellent Bars(over 50) and Restaurants. Accommodation in and around the resort is of a very high standard. The resort has won five best place to holiday awards since 2010 so book in advance if looking to arrive June to August. The resort stays open all year round and is an ideal location for some budget winter fun. Lagos is the main town and tourist centre of the western Algarve. Like much of the Algarve it manages to provide a good mix of quality activities and accommodation for all. Very much a family resort during the day, lagos also has a lively nightlife with some late night bars and stylish clubs although Portimao just down the coast is really the Clubbing capital. Lagos is a friendly tourist oriented town that is a temporary home to holiday makers from all across Europe. Despite a modern Marina and shopping complexes, Lagos remains a working fishing town that exists alongside tourism not because of it. 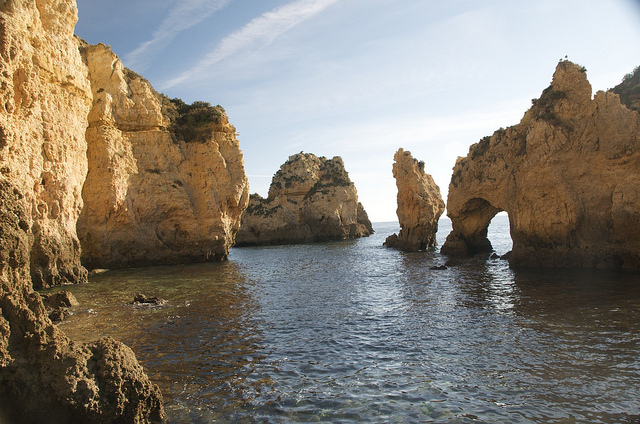 Lagos also has a rich history being the capital of the Algarve region for nearly 200 years. Historically the towns roots stretch far back, originally a fishing settlement was founded in the natural harbour by Phoenician traders in 350BC. Later the area was inhabited by Roman settlers and there are some areas of the Roman walls remaining. Later during the Moorish occupation from the eight century a purpose-built harbour was built which made Lagos a trade centre for the region. Taken back by the Christians in 1241 the town continued to be a major trading port, and was an import centre for African and East Indian Sugar,Metals and Grain. Lagos was also a hub for human traffic and the Mercados Dos Escravos(slave market) on the Praca da Republica is the original site of the only slave market to have operated in the Algarve. A statue of Prince Henry the Navigator stands on the waterfront at the Praca da Republica a reminder that for a time Lagos looked out to the new world as a centre of discovery. There is an excellent selection of shops, bars and restaurants in Lagos with the main commercial activity centred near the cobbled streets around the Rua 25 de Abril. Sun-worshippers can lounge on some of the best beaches the Algarve has to offer. The Meia Praia is located a kilometre east of Lagos. Stretching out for over four kilometres this flat stretch of sand is banked by cliffs tunnelled with crevices and grottos. More picturesque is the Praia de Dona Ana and the smaller more secluded coves of Praia de Pinhao and Praia do Camilo. All of which are clearly sign posted from the town. Lagos is served by excellent transport connections and there are regular buses from the Avenida dos Descobrimentos . For walkers the coastal path runs across the towns cliffs from the Ponda de Piedate as far as Luz but a head for heights is required for this one.